Update: The sale has ended but be sure and sign up for Eloisa’s newsletter so you don’t miss a thing! 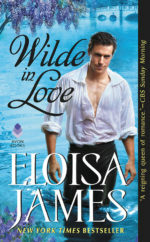 Wilde in Love, the first book in the Wildes of Lindow Castle series, is on $1.99 digital sale for just one week: through October 22. Get your ebook before the sale ends! Want more? Explore Eloisa’s book extras, including a video of the cover shoot, some insider author notes, and more fun stuff. Enjoy! Born to be Wilde is a Bestseller! Thank you so much to everyone who preordered or purchased Born to be Wilde. Parth and Lavinia debuted at #8 on the New York Times and #11 on the USA Today bestseller lists! There has been much celebrating here at Eloisa Central. Born to be Wilde seems to be a hit with readers as well. Born already has nearly 150 reviews on Amazon and is resting nicely at 4.7 stars. If you could also take a few minutes and leave a review at Amazon, Goodreads or BookBub, we would be so grateful! Registration for Wilde Denial closes August 7 at 11:59pm. Make sure you have submitted your purchase or preorder of Born to be Wilde by then. 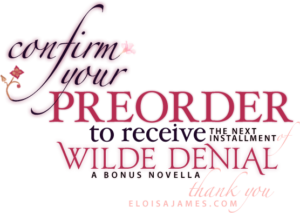 If you have any questions, send an email to preorder@eloisajames.com and we can help. Wilde Denial will be sent out on August 10! Just how is the Duke of Lindow going to convince Ophelia to become his third duchess? By finding another woman to woo, of course! Eloisa has also thrown in a bit of Lady Knowe and a Wilde child or two. Trust us, you don’t want to miss this installment! If you haven’t read the first 90 pages, don’t worry. The full story will be available to read. Have you read Born to be Wilde? We would be thrilled if you could share your thoughts on Amazon, Goodreads or BookBub.